My loverly Anniebelle posted this. And wow. 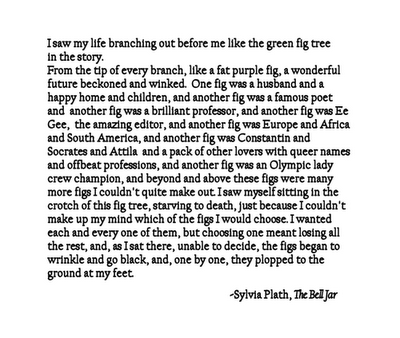 I have (embarrassingly) never read The Bell Jar, but its now shot way up on my list. This so very much describes me. I think it describes a whole crap ton of my friends (like Anniebelle, dur) although there are also friends who it does not describe. 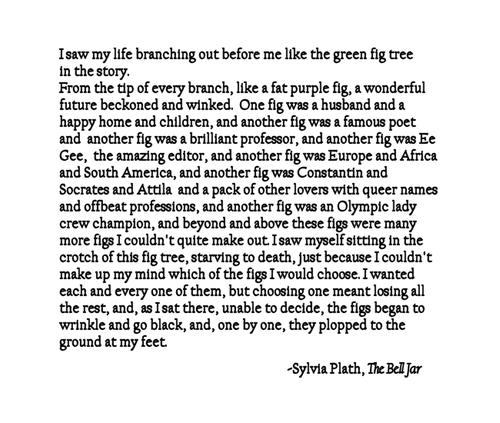 I have a lot of friends who picked their fig and they love it and are perfectly content to eat it all up. Anyway, this terrifies me, but also makes me feel better about myself. Things turn out okay for Ester Greenwood right?